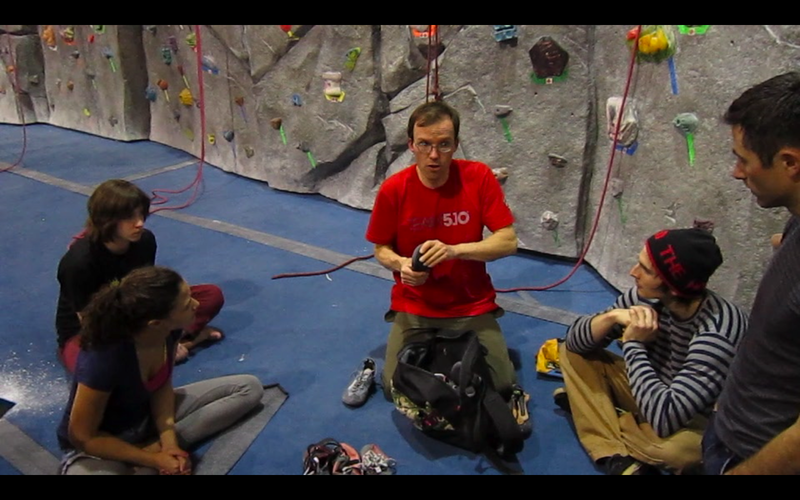 On Tuesday, February 21 Peter Beal, Daniel Woods, and Courtney Sanders held a Breakthrough Bouldering clinic at The Spot. The clinic was free for members and ended up running about twice as long as originally planned because, well, because the ins and outs of climbing are a pretty vast subject. The clinic started off with introductions from Daniel, Courtney, and Peter, followed quickly by names and goals from the 8 participants and 3 Spot staff who attended. It turned out that most of the participants had been climbing anywhere from a few months to a few years, and the Spot staff and clinic instructors Daniel and Peter have all been climbing for between one to three decades. Courtney is the exception, as she’s only been climbing for 3 years but has already progressed to elite status with an entire bouldering World Cup season under her belt as well as several V11 sends. 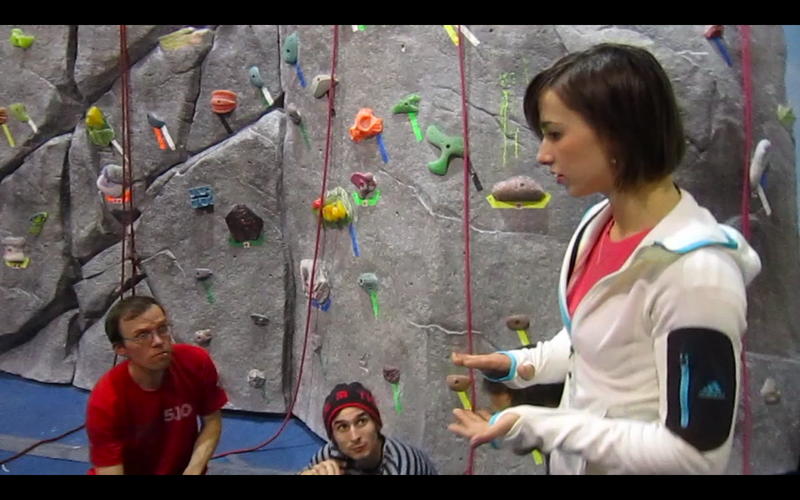 After intros Peter addressed one participant’s concern that she was unable to get out of her 4- spot plateau. He suggested that most climbers don’t think very clearly about what they are doing at any given moment. He said that if you watch most climbers you will see things they could be doing better that would help them get up a problem or route, and that examining all aspects of your own climbing can help you improve your own weaknesses and stack the odds in your favor. The closer you can get to perfect movement, Peter suggests, the easier the job will be. 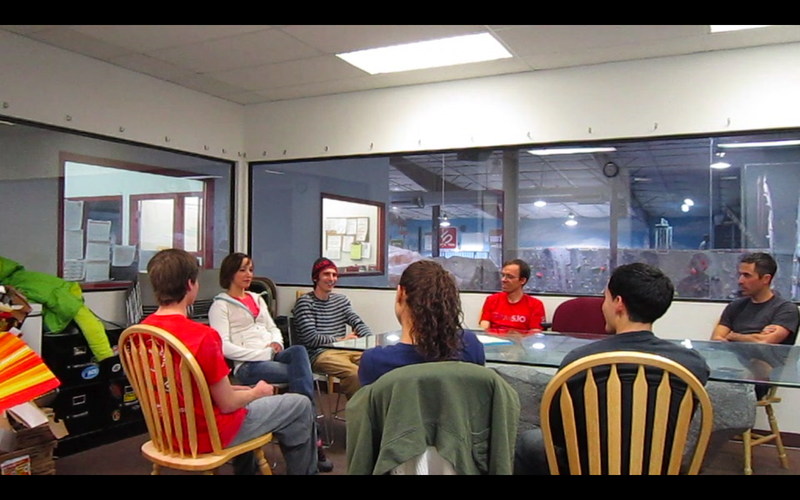 Considering some of the group’s climbing goals, Peter reminded everyone that factors such as season and weather could affect one’s climbing goals. For example, if a climber’s goal was to be strong enough to climb Gobot at Rocky Mountain National Park by the end of summer, the climber should consider that Gobot has a scary landing that is made safer by a big pile of snow and that a big pile of snow is more likely at the beginning of summer. Therefore, it might be more reasonable to make a goal to be strong enough to climb Gobot by the beginning of summer or by the beginning of next summer, when conditions are better for a safer experience. Courtney pointed out that goals come in many forms. As for competitions, Daniel and Courtney both said the biggest thing is to keep trying. You don’t always win, and sometimes you fail big time, but it is good experience for the future. The evening ended with a discussion about the importance of warming up followed by a comparison of different types of shoes and a walk around the gym to try different techniques for footwork and falling. Lots of valuable info was flying around, and I wasn’t able to record all of it, so make sure you stay tuned for future clinics from the Spot. After all, as Daniel said, everyone can stand to improve their own climbing and no matter how hard you climb you never stop learning. Peter Beal is the author of the popular Mountains and Water blog and also Bouldering: Movement, Tactics, and Problem Solving which can be purchased from The Spot front desk or online. 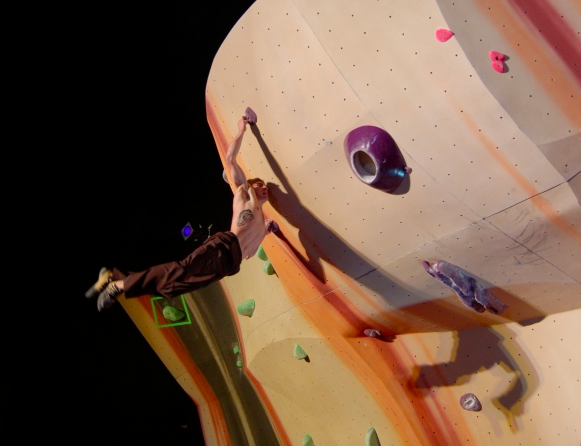 Daniel Woods and his wife Courtney Sanders are professional rock climbers. Will you post this video at some point? Sadly there isn’t much video–it was very loud in the gym and it didn’t come out super well. Sorry! But you should come to the next clinic. We will post when it is coming up. ABS Nationals 2012 – Women’s Qualis Done, Men’s Qualis happening now ABS Nationals!